During the early summer of 2011, after finishing a mission trip to Albania with the OCMC, my classmate, Rondal Burkhard and I travelled to Thessaloniki to visit churches and holy sites before returning to America. In the spring, before leaving for Albania, I had asked and received a blessing from my bishop to visit Mount Athos. His consent was contingent on my receiving a visa. Providentially, I had met a priest at Hellenic College who was well-travelled to the Holy Mountain. He wrote a letter to the Abbot of Xenophontos Monastery on my behalf. Thus, through the Grace of God, my friend and I were granted visas for a pilgrimage to the Holy Mountain. My friend and I were quite excited at the opportunity of visiting Mount Athos. I was looking forward to the trip because of the many inspiring stories I had heard from my Spiritual Father and from other priests in the Antiochian and Greek Archdioceses, as well as from my bishop, His Grace Alexander. Once we arrived, we were blessed by the opportunity to stay at St. Anne’s Skete. I was a guest at the house of the Theophilaion Brotherhood, under the care of Geronda Hieromonk Cheruvim (he is a Greek-American and a graduate of our Hellenic College, with a degree in theology from the Aristotelian University in Thessaloniki). I experienced many blessings during my 4-day visit, including being asked to chant Vespers and an Akathist in English at the chapel of the Theophilaion Brotherhood! The Skete of St Anne is perched high above the water, on the side of a mountain that plunges steeply down into the sea. The kalyvi of the Brotherhood seems to hang out in space above the sea; at night every star in the sky is sharp and clear due to the purity of the air and the lack of artificial light. I felt as if I was floating in the heavens. During the daytime, I worked in the little garden which was placed on a cliff right below the kalyvi. This is the very same garden where the blessed elder Anthimos (1913-1996) labored for many years until his repose. As I worked, all I could see was the vast expanse of the bright and brilliant blue water of the Aegean Sea. I felt as if I was connected with heaven, earth, and sea -- I truly felt the presence of God. The food we ate, while extremely simple and completely vegetarian, was some of the freshest and most delicious food I have ever eaten. I realized then that even the food tasted better because it was grown and prepared with love and prayer. Being totally taken aback by the story, I stood in great awe, silenced and humbled by this miracle done by a Saint so close to my heart. The Hieromonk then asked a favor of me. When I got back to the United States, he asked anxiously, would I be able to send an Icon of this Saint Raphael of Brooklyn to him on the Holy Mountain. After this request, he shuffled along with his English translator into a side room to write his name and address for me to take. I took this task joyfully. When I returned to America, I went to the Antiochian Village, where I had planned to work for two weeks as a volunteer during Session III. Being excited about the mission I had been given, I assembled the other volunteers, and together we pooled our money and sent the Hieromonk two beautiful Icons of our great Bishop, St. Raphael of Brooklyn, the great shepherd of the scattered flock of North America. Rejoice under the protection of our All-holy Theotokos forever. I received the Icons of St. Raphael, the bishop of Brooklyn, that you sent me. I would like to thank you for doing so and I would also like to apologize for my late response. I kindly thank you for the joy and blessing you have given me. I was not aware of the saint’s existence. The truth is, the saint performed a miracle for me shortly before we met at our Skete. I, therefore, have feelings of love and piety for the saint. I pray for the saint’s intercessions to follow you throughout your life. 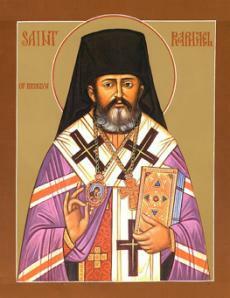 I ask that you revere the holy relics of Saint Raphael on my behalf. I thank you once again. May God’s blessing be abundant in your life. Rejoice, O Father Raphael, Adornment of the Holy Church! Thou art Champion of the true Faith, Seeker of the lost, Consolation of the oppressed, Father to orphans, and Friend of the poor, Peacemaker and Good Shepherd, Joy of all the Orthodox, Son of Antioch, Boast of America: Intercede with Christ God for us and for all who honor thee.